The Peak District Lead Mining Mueum (part of PDMHS) hosts Derbyshire Heritage Events and offers Guided Heritage Walks in Derbyshire – for dates, times, costs and other details please check the Museum Web Site news page or their Facebook page. The guided heritage walks are led by local expert Tony Wood. 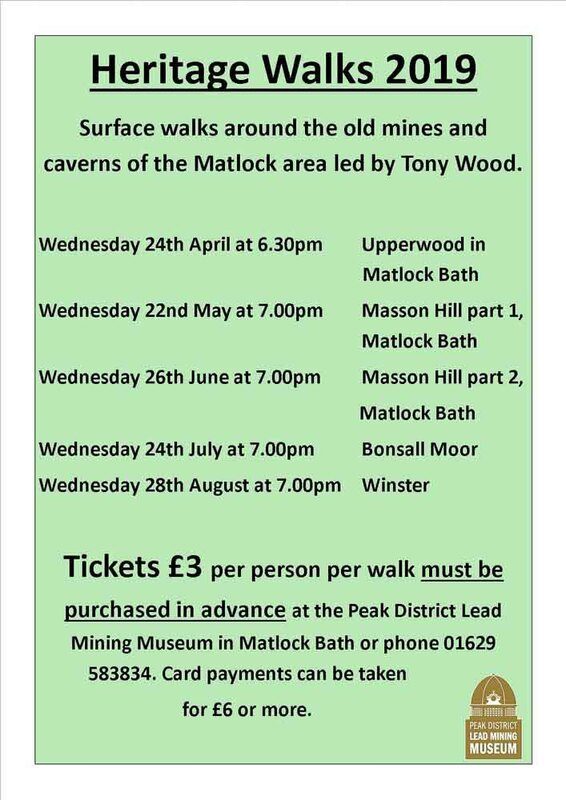 Tickets must be purchased in advance from the Peak District Lead Mining Museum in Matlock Bath. Not only does Tony have an extensive knowledge of local lead mining history, but also the people and places. His walks have usually been sold out and attract many “repeat visitors”. You can buy tickets in person at the Museum (check the Museum web site for opening times) or you can email here or phone 01629 583834. Card payments can be taken over the phone for a minimum of 2 or more tickets. Evening walks begin at 7.00pm and aim to finish by 9.00pm. The starting point will be given when you purchase your tickets. In addition to walks organised by the Museum, PDMHS also operates a series of free heritage walks and underground trips. For underground trips, BCA public liability insurance is mandatory – this can be arranged for PDMHS members by the Society’s Underground Exploration Group. Derbyshire Heritage Talks are hosted at the Museum in Matlock Bath. Talks are on Tuesday evenings at 7:30 and cover a wide range of historical aspects of the area, including the mining heritage but also industrial archaeology, folk-lore and social history in Derbyshire. These heritage events are well attended and tickets should be purchased in advance (at the museum or by phone to 01629 583834) to avoid disappointment. Tickets cost £6 (£5 to PDMHS members and Friends of the Pavilion). 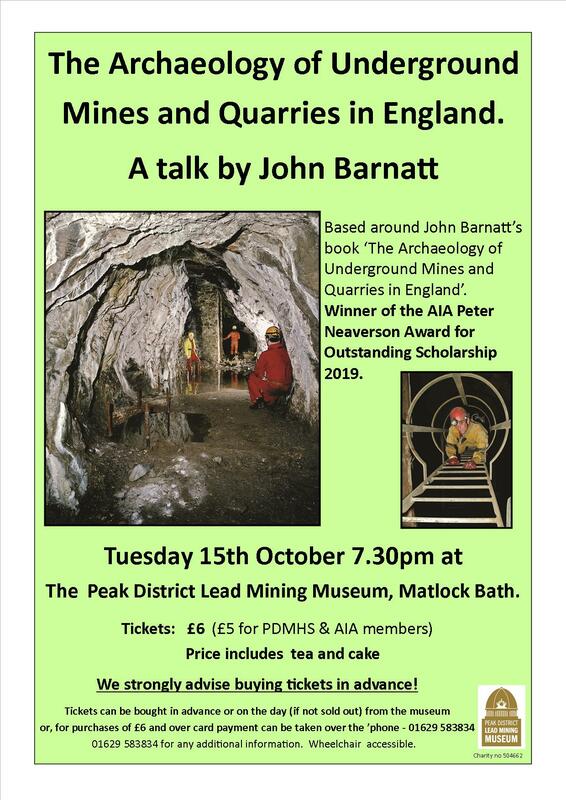 15 October 2019: A talk by John Barnatt, who has a long involvement in the archaeological investigation of the history of mining, especially in the Peak District. This talk is likely to be very popular, so book early!